Valentine’s Day is just a month away, but we all already know we have been fantasizing about what we will be doing with our respective loved ones. You have planned it down to the last detail – even the outfit you will wear – but you still need a new, unique hairstyle to wow him, remind him just how beautiful you are. Well, here are ten of the sweetest (and some of the easiest) Valentine’s Day hairstyles I could find. Why call this style the heavenly heart? Well, because it is so simple and straightforward, it will only take you five minutes or less to create. Plus, it is just so darn cute. 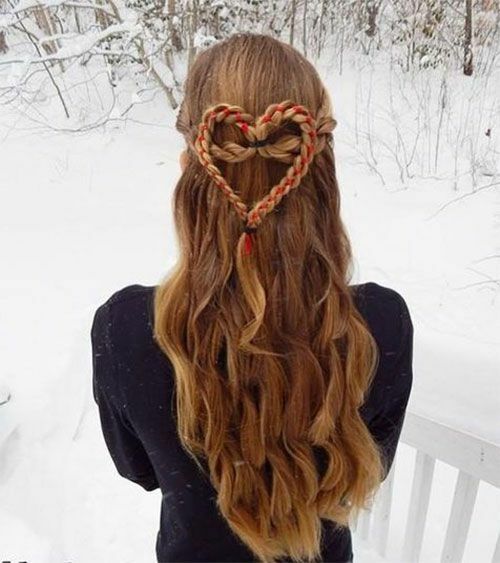 Two braids, one ribbon, and two hairbands are all you need to create such a unique yet sweet hairdo.